MANILA, Philippines - State weather bureau PAGASA said that Typhoon Hanna (international name: Soudelor) has weakened while continuously moving in west northwest direction as stated on its 11:00pm update Wednesday, August 5, 2015. 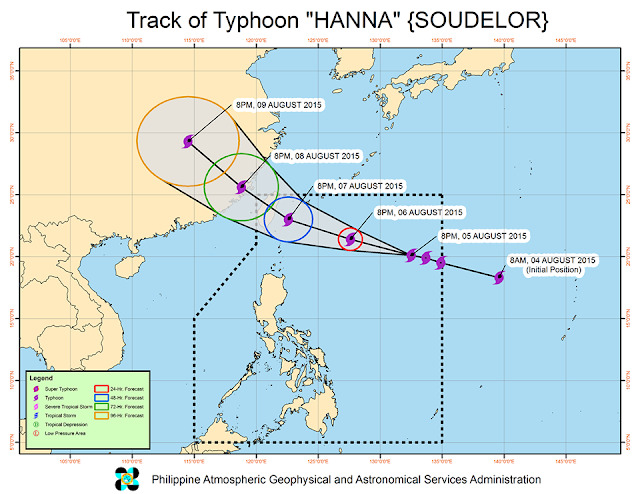 At 10:00 PM today, the eye of Typhoon Hanna was located based on all available data at 1,060 km East of Basco, Batanes (20.1°N, 132.1°E). It has maximum sustained winds of 175 kph near the center and gustiness of up to 210 kph and forecast to move West Northwest at 20 kph. Public Storm Warning Signal No. 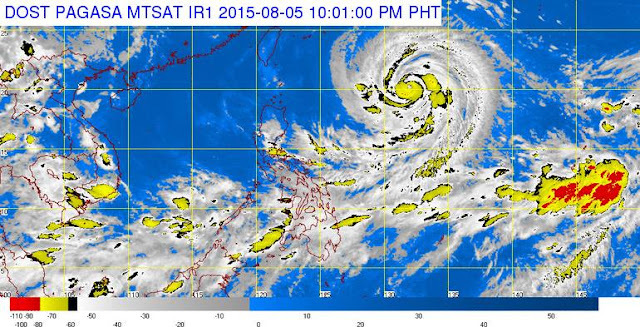 1 (30-60 kph Expected in 36 hrs.) was raised over Batanes Group of Islands. The estimated rainfall amount is from moderate to heavy within the 650 km diameter of the typhoon. Fisher folk are advised not to venture out over the Northern and Eastern seaboards of Luzon, the seaboards of Palawan, of Visayas and of Mindanao.